Over 230,000 FIRST volunteers worked 17,000,000 hours and put on more than 2,600 events during the 2016-2017 season! Our dedicated volunteers are the heart of our programs, and it is our amazing volunteer community that makes FIRST a success. FIRST volunteers share their talents, their passions, and their time to make a difference in the lives of students all over the world. Many are celebrating over 20 years as part of the FIRST community. Most volunteers agree: it’s easy to get started, and impossible to stop! Every FIRST volunteer has a story. We want to hear yours. Tweet it, Snap it, Instagram it, post it on Facebook, make a short video on your phone, or just send us a good, old-fashioned email. 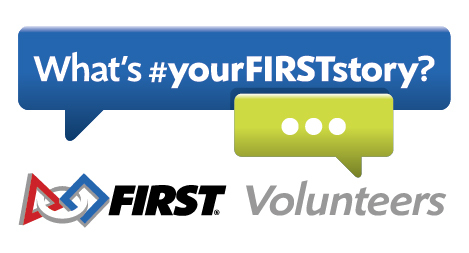 Tell us why you volunteer with FIRST, your favorite FIRST volunteer memory, or what inspires you to be a FIRST volunteer.